Phase 2 of our house renovations began on Thursday. 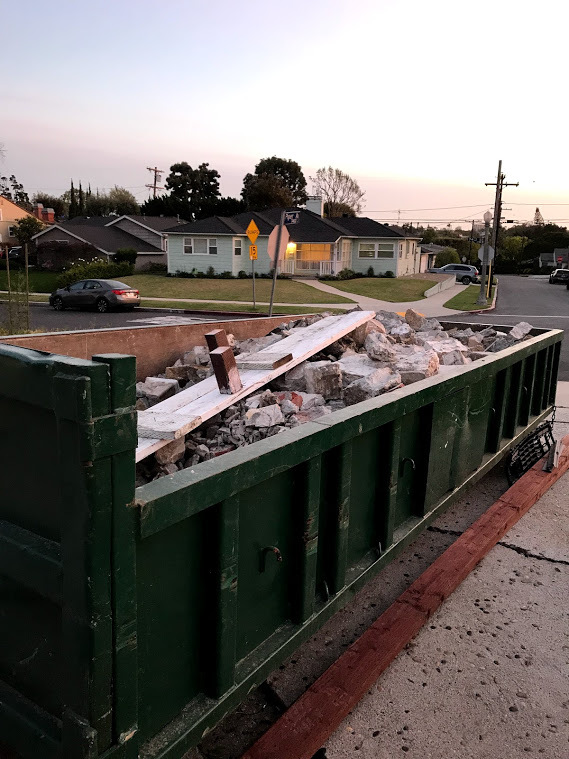 That means we have a dumpster in our driveway (again) for the next two weeks while they demolish parts of the garage and dig a 2 ft. trench around it. We’ve made a lot of memories in our garage, namely spending countless hours in it last year painting the kitchen cabinets. We’ve learned so much and feel much more prepared to take on this “smaller” project. We also decided to hire a different contractor for a few reasons, including better communication and more organized project management. Marcus at Custom Home Craft has been providing really clear blueprints and daily updates to move everything forward smoothly. It’s only been 3 days, but we’ve seen so much progress and improvement already. 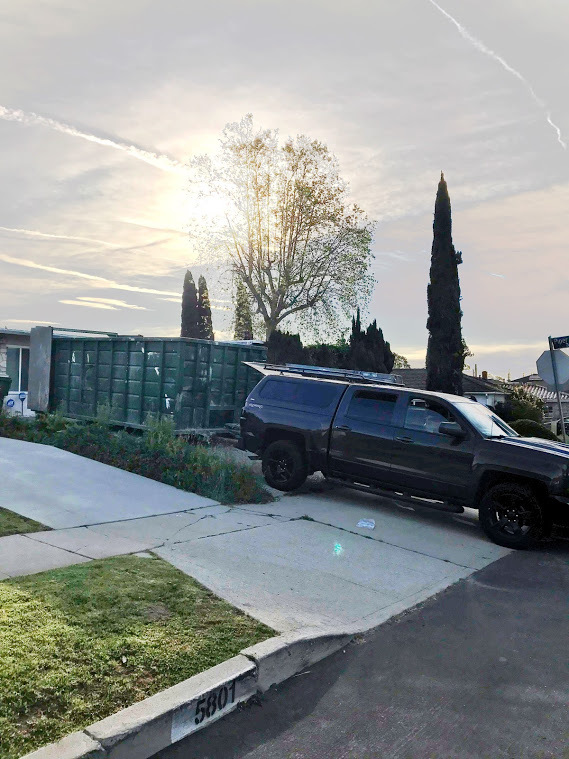 His crew cleared out the old drywall inside the garage and immediately started jack-hammering the concrete pavement between the house and the garage. We’ll be turning this into a laundry room hallway that connects the house to the garage, and they need to dig a 2 ft. trench to create a crawl space where they’ll run the electrical and plumbing. They’re also clearing and digging the excess brush around the garage and in the front yard. On the first day alone, they filled the entire dumpster. It’s crazy to see parts of the house and garage we’ve never seen before because they were hidden under old vines. They’ll be removing this stone wall and replacing it with stucco. We’ll also be adding the front door here. Initially, we wanted the door in the back to avoid have 2 entrances in the front of the house. However, the fire department made us change that so we’re rethinking of ways to landscape the front paths. A couple ideas include adding steps that lead to a small gate or landing in front of the ADU. 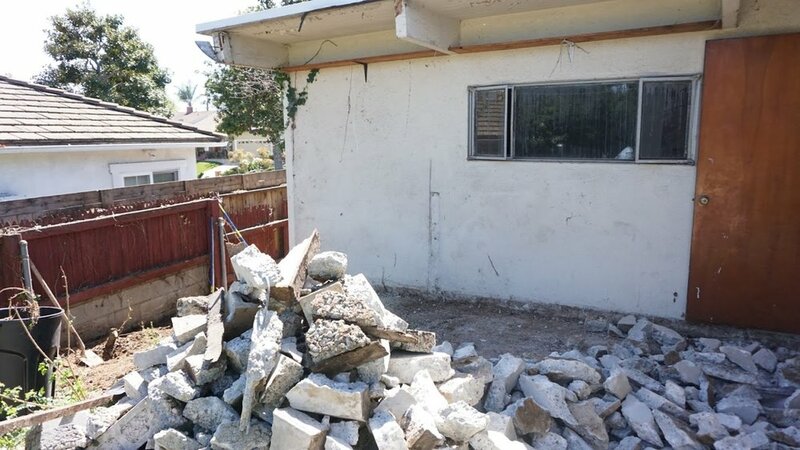 Also as of this morning, the decorative stone wall on the side of our house was removed. Although it had character, it was extremely bulky and limited our access to the side of the house. 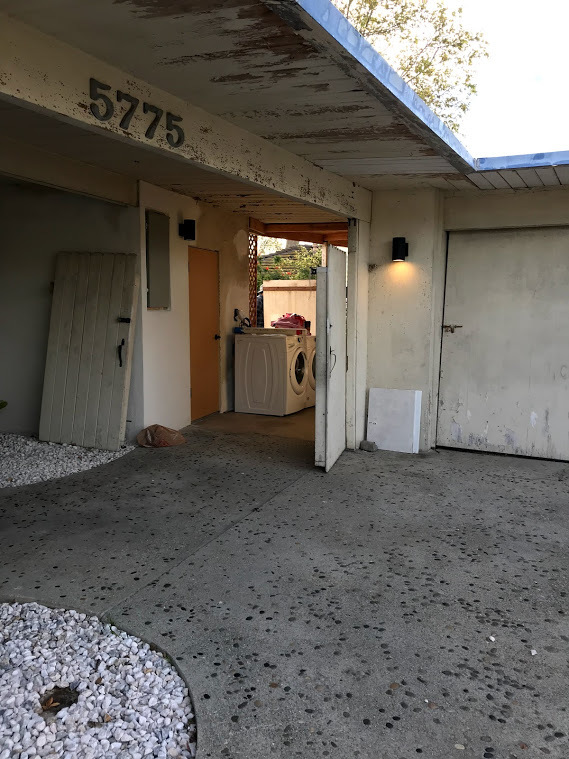 Now that it’s removed, we’re able to patch it with stucco to match the rest of the house and open up the walkway which we’d like to eventually level with concrete. This also means we can easily roll the yard bins to and from the backyard much easier. Slowly but surely, we’re making much-needed progress to bring more curb appeal to the house. Our contractor even told us that while his crew was working, a couple stopped in front of our house and applauded their work. Our neighbors can’t wait to see our project unfold!